Unfortunately, the Reliable Cheese Company is no longer in business, but I’m leaving this because of the links to cheeses and charcuterie. Very sad to see this close; now for cheeses in this area, there is a Fresh Market, A Southern Season (which has an awesome selection of cheese and charcuterie). Wine Authorities carries some special cheeses, and the Durham Farmers’ Market has cheese vendors who come there. Whole Foods also carries cheese. My local Harris Teeter has a rather good selection of pre-cut cheeses–e.g. I can find Etorki there frequently. After going to the Wine Authorities tasting on Saturday and coming home with raclette, I just had to go check out the Reliable Cheese Company this afternoon (not open on Mondays, but are on Sunday afternoons). It’s not exactly on my way home, but I expect that I’ll be following that route more often in the future! There were some great cheeses in the case–I could cheerfully do one of each. There were other goodies like slab bacon, bresaola, just to mention a few. The Facebook page will keep you up to date on what’s happening at Reliable Cheese Company. Came home with some lovely, luscious Taleggio cheese–just perfect texture. This is going to get a bottle of Gewürztraminer or Riesling opened to enjoy while nibbling on this cheese–It will need nothing more than some fresh bread and a bit of fruit to make supper. Then I found the mortadella and had to bring home enough for one decent sandwich (that’s lunch tomorrow). After perusing the sandwich menu, I could not walk out without my supper. 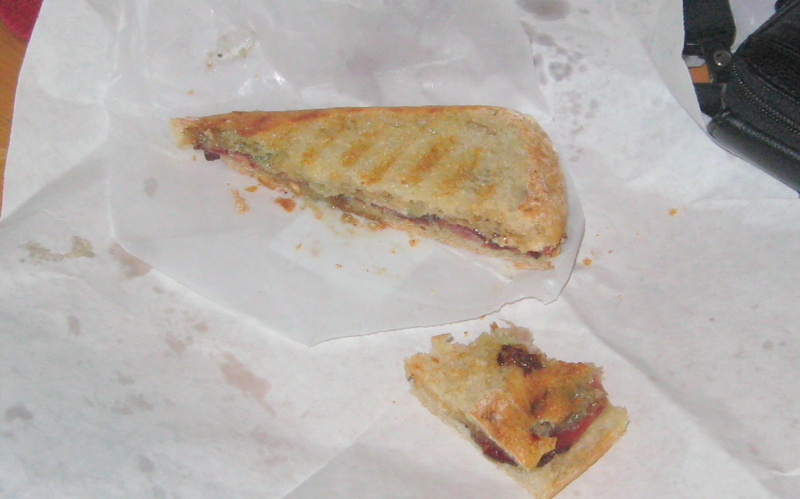 I came away with the country ham, blue cheese, and fig jam sandwich.